Happy Birthday today to my favorite son, Zach! This is his birthday cake from our Sunday celebration. 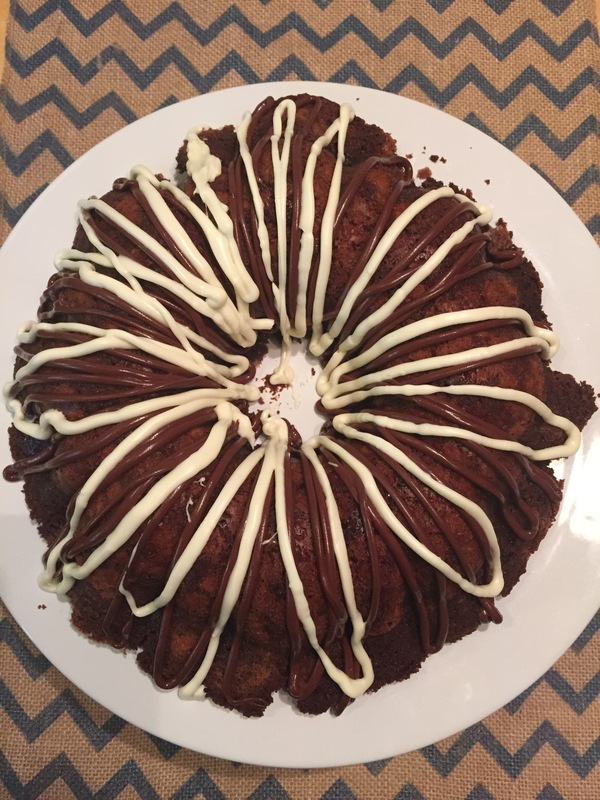 It tasted really good but looked kind of funky, you can kind of see from the picture that when I turned it out of the pan, it sort of oozed out over the plate, I’ve never had a bundt cake do that before, strange. Also it was super crunchy on the edges but nice and soft in the middle, weird cake but tasty! The recipe comes from Better Homes and Gardens. 1 Preheat oven to 325. Combine sugar, coffee, chocolate and butter in large saucepan. Cook and stir over medium low heat until chocolate and butter are melted, Remove from heat and cool slightly. 2 Spray 10″ tube or bundt cake pan with cooking spray with flour (the one for baking). Combine flour, baking powder, baking soda and salt in small bowl. 3 Stir yogurt, eggs and vinegar into chocolate mixture. Gradually mix in flour, stirring just until combined. Stir in 3/4 cup white chocolate chips. Pour into prepared pan. 4 Bake 50 – 60 minutes or until toothpick inserted in center comes out clean. Cool in pan on wire rack 15 minutes before turning out to cool completely. 5 Microwave remaining 1/2 cup white chocolate chips for 1 minute, stir, repeating at 30 second intervals until melted and smooth. Repeat in a separate bowl with milk or semisweet chips. 6 Place melted white chocolate into a sandwich bag, snip corner and pipe over cake. Repeat with milk or semisweet chocolate.